There is only one month left until the G7 Summit at La Malbaie, which will take place at the Richelieu Manor from June 7th to June 9th! As is the case each year, the seven main imperialist and colonialist powers of the world will meet to decide how to keep pillaging our communities, while extracting as much profit as possible. 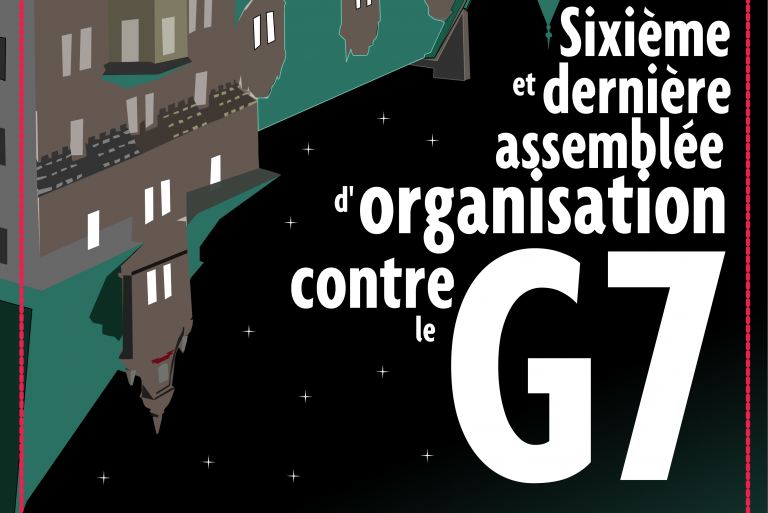 Thursday, June 7th, at 6PM in Quebec City at the Parc des Braves: Join us in a festive and popular protest against the G7, capitalism, colonialism, racism and for open borders! Friday, June 8th, in the Quebec City area, at 7:30AM, there will be an activity to disrupt the G7 Summit. The RRAG7 also calls for a full day of disruptions of the activities of the G7 Summit: Be creative! We are ready to denounce this unfair system as long as it is necessary! It is now time to subscribe. Yes, yes, subscribe. Because without a subscription it is difficult to reserve the right number of buses and to find lodging for those who need it. To subscribe, go on our website and reserve your place before May 27th. The website also include details on how to subscribe non-electronically! Note that reservation will only be effective when you will confirm your subscription during one of our General Assembly, or during one of our vents. At that time, there will be a “Pay What You Can” box. We suggest a contribution of 20$ for transport. Of course, nobody will be turn back for lack of funds. All the information collected will remain confidential and will be destroyed after the G7. The RRAG7 invites you at its last organization assembly, on Saturday, May 12th from 1PM to 4PM at the 1710 Beaudry (Comité social Centre-Sud). Spread the word, let’s be as many as possible for this last assembly! It will be an opportunity to exchange on the actions to come or to participate in their organization by joining one of the committees (legal, mobilization, logistics, students, popular education). This assembly will also be an opportunity to confirm your bus and housing reservation as well as the last logistic details. ** The room is wheelchair accessible. ** Whisper translation is available. For more information, email info@antig7.org or vitit our website.